Mega Sale! Free Shipping Included! Save 26% on the Bright Green BG-WM8CB Chalkboard Wall Mounted Frame Kit by Bright Green at Tulips Orchids. MPN: BG-WM8CB. Hurry! Limited time offer. Offer valid only while supplies last. Simply select plants and populate the planting cells by following the planting instructions provided with your kit. Mounting your planter is easy! Simply select plants and populate the planting cells by following the planting instructions provided with your kit. Mounting your planter is easy! Each unit can be hung separately or in groups. Tilt the unit upright and attach it to any sound, vertical surface using the mounting bracket included with your kit. Water thoroughly. Water is added through the top watering irrigator and spreads evenly across the moisture mat and drains out the bottom of the planter into the collector. Excess water can be drained by removing the drain plug. 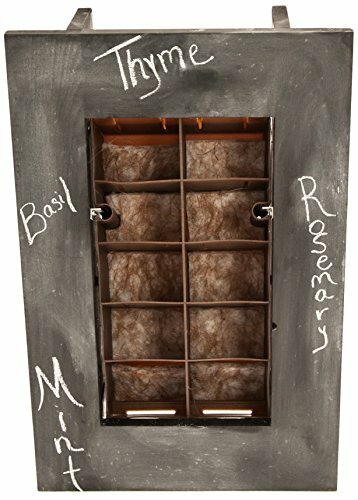 Bright Green BG-WM8CB Chalkboard Wall Mounted Frame Kit can be filled with the plants, flowers, herbs, vines, or succulents of your choice to create a truly unique work of art. If you have any questions about this product by Bright Green, contact us by completing and submitting the form below. If you are looking for a specif part number, please include it with your message.